GHI participants' training culminates with visits to two local HIV clinics. 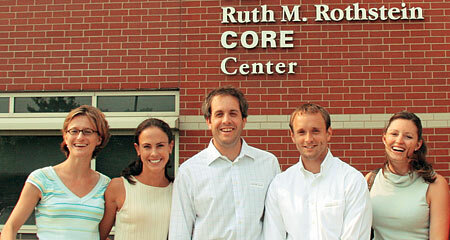 Above, from left, are Antonia Karbe, Meredith Wilson, Glenn Pappalardo, Rich Billings and Carolyn Starrett, all '07. Two groups from the Kellogg School's Class of 2007 are putting their new degrees to work in Africa this summer, conducting market research at HIV testing centers and treatment clinics, an effort that Meredith Wilson '07 calls unprecedented. The trips are part of the Global Health Initiative (GHI), introduced in 2004 as a collaboration between the Kellogg School and the McCormick School of Engineering. As part of a grant received by Northwestern University from the Bill and Melinda Gates Foundation in August 2006, GHI will research and develop affordable diagnostic devices for testing and treating HIV. GHI is integrated into existing Kellogg programs, including Kellogg Corps, a service initiative founded in 1996. To date, the program has sent more than 200 Kellogg volunteers to about 30 developing countries, including those traveling to Africa this year. As part of the grant, Abbott and Inverness Medical donated access to intellectual property for two types of HIV diagnostic tests. These tests are expensive and require resources, such as electric and trained personnel, uncommon in rural Africa. "We are trying to bring ground-breaking technology to people who really need it," Wilson says. "We're bringing techniques and applying our Kellogg knowledge in a setting that is new." This research builds on studies done by students in March through the Global Initiatives in Management trip to Africa. Kara Palamountain '04, GHI executive director, says the students who conducted that work in Zambia and South Africa provided feedback on best practices that the Kellogg Corps participants are applying as they meet with clinicians and patients in some 40 clinics. Wilson is leading one group, which is conducting research in Tanzania, Uganda and Rwanda, while Palamountain is heading the other group, working in South Africa, Swaziland, Lesotho, Malawi and Zambia — all countries with high rates of HIV infection. Besides the leaders, the teams include six Kellogg graduates, one Northwestern medical resident and two medical students. Palamountain says the participants prepared logistically for the excursion, but also took supplemental non-credit classes, learning about HIV and AIDS. The graduates will go on to pursue their careers, but GHI's research will continue. Each team will report its findings, and Palamountain says that enrolled students will synthesize the data and begin working with a team of McCormick scientists and engineers to develop machine prototypes. By next summer, GHI leaders plan to assess whether the prototypes work in clinical settings, an effort that could lead to eventual mass production.